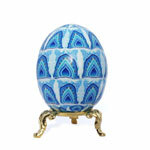 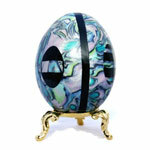 With unusual and intricate designs, these may be the most unusual and wonderful decorated eggs you'll ever encounter. 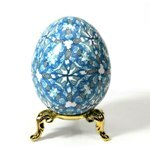 I create eggs in traditional Easter spring/floral and garden theme designs, others with "kaleidoscope" designs which are as intricate as Ukrainian Easter eggs, and other designs, unusual to find in eggs, such as Taj Mahal and Paisley. 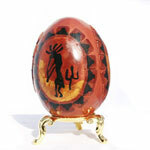 Several are based on different design styles that I, personally, love, like Southwest Kokopelli art and Japanese art. 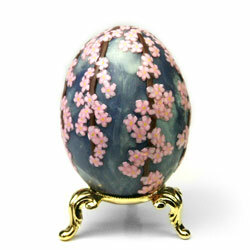 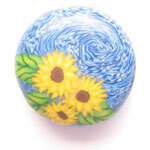 All eggs start out as a real bird egg, then are covered with designs in polymer clay. 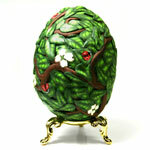 For more information on how these eggs are created, click here.